In March 2017, Scotty & I will celebrate our 38th anniversary. God has blessed us with 4 beautiful granddaughters and we are busy with family and ministry. Looking forward to seeing everyone for a great time of fellowship! Jim and I have been married for 37 years and have two daughters, Jessica and Amanda. Jessica is married to Joshua and they are in the process of adopting a beautiful three year old girl. Amanda is engaged to Chris and their wedding will be in April of 2017. Jim has been with ConocoPhillips for thirty five years and hopes to retire next year. We have lived in Dubai, UAE; Doha, Qatar; Lima, Peru; Malta and Houston (three different times). I have worked in American school systems in Dubai, Houston and Doha and done volunteer work with children in Lima and Malta. I am currently teaching pre-school in Houston. Sorry that I couldn't make it to the past reunion. I was unable to attend due to a new job. Since my last post I have relocated. 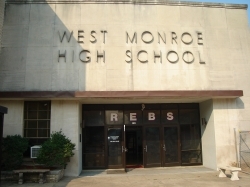 ( I feel like a gypsy..lol..) My husband is Terrance Nelson (also) a West Monroe High Graduate (Class of 83)I have 4 children now Ro`jer Nelson(26) ( Erica Johnson Bertrand (30), Arrial Nichole Johnson (24), Erroll Johnson, Jr (aka CJ) (22.) I am also raising my niece Angel age 10. I have 2 Grandchildren, a boy>Elijah age 5, a girl>Asia Gianna age terrible 2 soon to be greesome 3 some ;). Currently active duty Navy with 27 years service.